SEATTLE, WA--(Marketwire - September 24, 2007) - Non-Surgical Aesthetic Treatment: Join a live, interactive, 90-minute demonstration on the evaluation and treatment of the aging face using non-surgical aesthetic lasers. The session will be hosted by Dermatologist Donald Groot, MD and Plastic Surgeon Richard Green, MD. The program will begin with a description of the aging face, followed by a brief overview of laser physics. Physicians will demonstrate laser treatments on real patients and describe several clinical approaches to achieve skin rejuvenation. Specific subjects will include: facial vascular conditions, pigmented lesions, facial wrinkles, uneven skin texture, skin tightening -- and a new skin resurfacing laser that provides full epidermal turnover with only one treatment and minimal patient downtime. According to the American Society for Aesthetic Plastic Surgery, nearly 11.5 million cosmetic procedures were performed in the United States in 2006 with non-surgical procedures making up 83% of the total. Americans spent approximately $12.2 billion on cosmetic procedures in 2006. Donald Groot, MD is a board-certified dermatologist and clinical professor of medicine at the University of Alberta, Canada, and is considered a leading authority on cosmetic laser surgery and the impact of aging on the skin. Richard Green, MD is a board-certified plastic surgeon in Vancouver, Washington and has successfully combined both surgical and non-surgical aesthetic procedures for more than 12 years. Both physicians bring expertise from two different specialties and will deliver a balanced overview of non-surgical aesthetic medical lasers. This live demo and panel discussion is hosted by Cutera, Inc. (NASDAQ: CUTR), a leading medical device manufacturer specializing in aesthetic laser and light-source technologies. 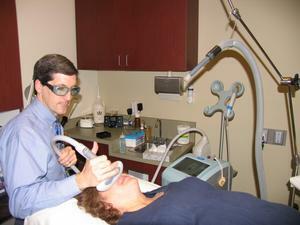 The physicians will provide an overview of laser technology and its clinical benefits for treating the signs of aging.